Warren Feeney has made former Northern Ireland Under-21 international Sammy Morrow his first signing as Linfield manager, on a one-year contract. The 29-year-old forward has previously played for Ross County, Hibernian, Derry City and Coleraine. 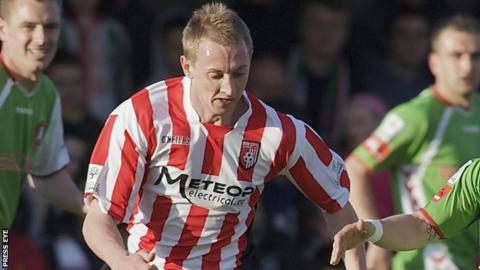 "He's got great experience, good pedigree and knows the Irish League scene well," said Feeney. "He's the sort of player who won't give up easily and I'm genuinely excited about having him on board." "I know Linfield tried to sign him a few years ago and having met him today I know how excited he is about getting this chance to play for Linfield. He will give us strength and bravery in the striker position. "He's a passionate player and he was really enthusiastic about signing for Linfield. From my point of view, signing him really was not a very difficult decision to have to make." Morrow's other former clubs include Tranmere Rovers and Ipswich Town.